Meet and Drink with the Oakcliff All American Offshore Team Tonight!!!!! 01 Jun Meet and Drink with the Oakcliff All American Offshore Team Tonight!!!!! Come meet the team at The Boatyard Bar and Grill at 7:30pm! There will be clips of Annapolis Wednesday night racing and cold drinks. The team is excited to be in Annapolis, and would love to meet the local sailors. Tonight there will be 2 dollar domestic bottles, a dollar off draft beer, and 4 dollar well drinks. 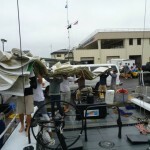 The team is looking forward to seeing you there and is excited to check out the Annapolis Wednesday night race scene.